Flower appliques and whimsical butterfly buttons add fun detail to this cool little romper-and-hat set. 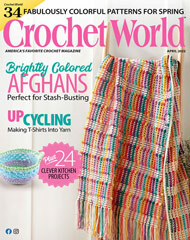 This e-pattern was originally published in the May 2010 issue of Crochet! magazine. Size: Romper: 3-6 months. Hat: 17" circumference. Made with medium (worsted) weight yarn and size J (5.5mm) hook.